An IRA represents security for the account holder and those he holds dear. 2. Can an IRA Be Transferred From Spouse to Spouse? Congress enacted the Employee Retirement Income Security Act, or ERISA, in 1974 to protect and complement workplace retirement plans, such as pensions. ERISA authorized IRAs as part of that initiative. Workplace plans benefit one specific employee; similarly, a worker owns an IRA in her own name and cannot hold an account jointly with another person. However, the IRA rules are flexible enough to achieve many of the goals of joint ownership even though the account is technically in one person’s name. 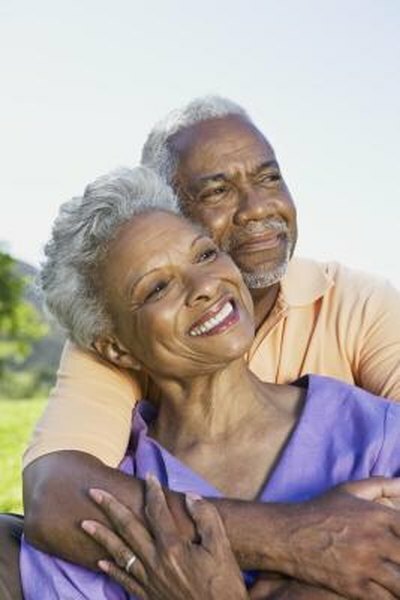 IRA stands for individual retirement account, also called an individual retirement arrangement by the IRS. True to its name, it is an individual account. The account holder must be a natural person -- corporations, partnerships, trusts and other entities aren’t eligible. The IRS also makes clear that only one name can be on the account; even your spouse can’t participate in your IRA. If it seems unfair that someone who does not earn money can’t participate in his spouse’s IRA, consider setting up a spousal IRA. Income that one spouse earns can fund the other’s IRA. So, for example, although the IRS won’t allow you to contribute $11,000 to a joint IRA, you could set up two IRAs and put up to $5,500 in each, as of 2013 -- 6,500 if you are over 50. If you want to be sure that the account balances remain roughly equal over time, be sure to invest the funds in the same way. You have much more freedom when it comes to naming beneficiaries for your IRA. If you name your spouse as your sole beneficiary, she can elect treatment as the owner of the IRA after you pass away. You can also name someone other than your spouse as beneficiary, although that person must maintain the funds in the deceased's name for the benefit of the beneficiary to maintain the tax advantages and cannot contribute to the inherited IRA. You can name multiple people as beneficiaries, and you can even name a trust, although that has its own set of tax implications if the trust is not set up carefully. A spouse doesn't need to be named on the IRA to have a claim to the assets should the marriage dissolve. Divorce is one of the rare cases in which the IRS allows the tax-free transfer of IRA assets from one living person to another. A divorce settlement can direct the IRA owner to roll over funds to an IRA held by the ex-spouse. If the settlement provides for transfer of all the assets in an IRA, the account owner can simply change the name on the IRA to that of the ex-spouse.